The Jordan Howard trade rumors were like a pesky weed that wouldn’t go away all offseason. They first sprouted up shortly after Matt Nagy was hired as head coach. The prevailing belief was that Howard’s lack of precision as a receiver out of the backfield made him one-dimensional. Given how much Nagy loved throwing to the backs in his offense in Kansas City, that presented a problem. The flames were further fanned when John Mullin of NBC Sports Chicago hinted that the Miami Dolphins might be sniffing around a potential deal. Then Howard himself removed all Bears-related photographs from his Instagram (or at least the front page). People started panicking. 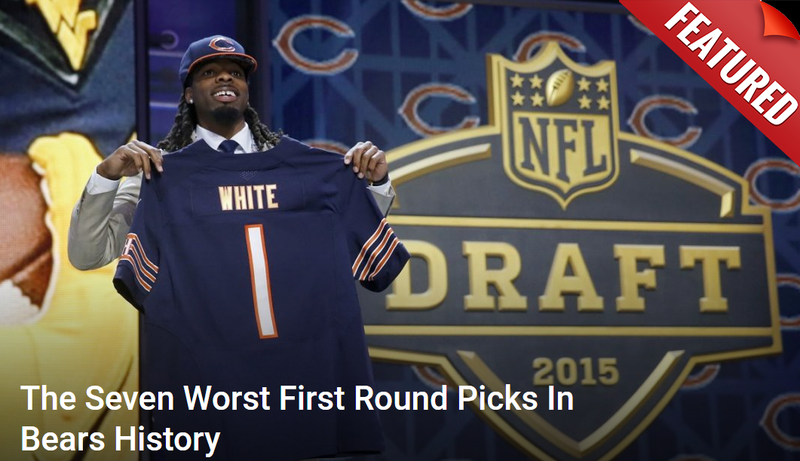 There’s no way the Bears would actually do this, right? They wouldn’t give up their best offensive player just because he’s not a perfect fit for the scheme. Thankfully logic and reason prevailed. The Bears insisted Howard was never on the table and the rumors were a wild goose chase. Yet that hasn’t stopped others from continuing to fan them and cooking up ever dumber ideas for how it could happen. Brad Gagnon of Bleacher Report decided to offer potential trades that could happen before the upcoming 2018 season. Deals that could solve a number of issues for current contenders. The fact he had the San Francisco 49ers on that list already made it difficult not to eye-roll. Then he uncorked who they should go after and even more absurd the price they could likely get him for. “The Niners signed Jerick McKinnon to a four-year, $30 million deal to replace Hyde, but the 26-year-old doesn’t have the same type of track record. He has never carried the ball 160 times in a season, and he averaged only 3.6 yards per carry during his final two seasons with the Minnesota Vikings. Might the Chicago Bears be willing to offer San Francisco a workhorse to team up with McKinnon? Third-year running back Jordan Howard’s rookie contract is half done, and the 2016 Pro Bowler was the subject of trade buzz earlier this offseason, according to John Mullin of NBC Sports Chicago, after Tarik Cohen shined as his rookie backup in 2017. …………………………………………………………………………………*cough**cough*. Sorry, I just woke up after a brief faint spell from laughing too hard. Let’s get this straight. This guy thinks the 49ers would be able to land a Pro Bowl-caliber running back who is still just 23-years old coming off back-to-back seasons of over 1,000 yards for…wait for it…a second round pick? That might be the best joke ever told. Now look I don’t want to make this seem like a constant snipe at Mr. Gagnon. He was likely trying to fill a list and this one seemed (to him) like a fairly solid possibility. Except no. It’s not. Not at all. Never mind the Trubisky trade with San Francisco. Sending Howard to that team for a second round pick would be the real fleecing.